Groups and organizations across West Virginia University are collaborating to create a night of body acceptance for students. 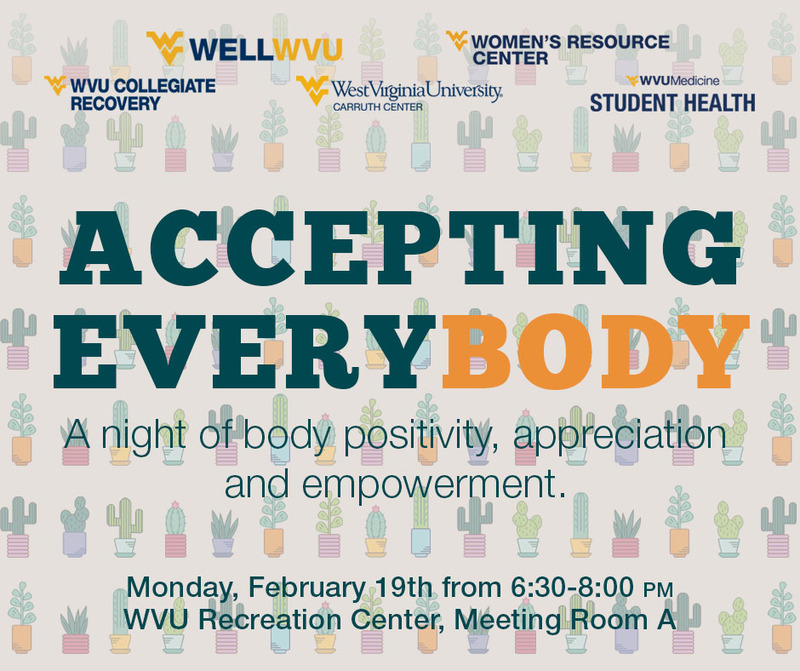 The WVU Collegiate Recovery Program, WELLWVU, Carruth Center, WVU Medicine Student Health and the WVU Women’s Resource Center will host “Accepting EveryBODY” on February 19, from 6:30 p.m. to 8:00 p.m. at the WVU Recreation Center, Meeting Room A. The event will feature opening remarks about the importance of self-acceptance and the body positivity movement, followed by a panel discussion. Panelists include Dayna Charbonneau, sports psychologist for the WVU Department of Intercollegiate Athletics; Charlotte Hoelke, coordinator of the Women’s Resource Center at WVU; Kimberly Allen, undergraduate student and member of Project Heal; and Sina King, registered dietitian and PhD student in the Clinical and Translational Sciences Program. Following the panel discussion, attendees will be able to participate in a guided meditation and assorted hands-on activities developed by student organizations and others from around WVU. “Accepting EveryBODY” is free and open to the public. Snacks will be provided, as well as giveaways from local businesses, including The Tea Shoppe, Morgantown Power Yoga and Morgantown Running. For more information, please contact Olivia Dale Pape at olivia.pape@hsc.wvu.edu.